It’s nearly Mother’s Day and I can’t wait to show Granny her Mother’s Day surprise! Her sister, Grandma Reese is moving to Family Farm to start her Knitting business! 1. The farm could use a little sprucing up for Mother’s Day. We should also make a good impression on Grandma Reese. Let’s start with some Carnations and a matching Fence to boot! 2. The farm looks fantastic and just in time too! Grandma Reese is finally here. Let’s set up her Knitting Machine and give her some Wool to see what she can do! 3. I asked Grandma Reese what her secret to happiness is and she said "It’s no secret deary. It’s the warm fuzzy feeling you get from putting on a fresh pair of Bunny Slippers." Aw. 4. Oh oh! Grandma Reese lost her Knitting Needles in a Haystack. I told her not to worry ’cause you had excellent eye sight and could find it in a jiffy! Right? 5. Granny came out of her house and cried tears of joy when she saw her sister! Make these two lovely ladies some matching Scarves to complete this splendid Mother’s Day! 6. What a joyous day! Time to make some heart-felt Cards and yummy Cake to celebrate Mothers around the world. Happy Mother’s Day to all you Moms. We sure do appreciate you! 6. x 5 = ? "Produce Fine Silk Scarf in the Granny Knitter"
Where can I FIND the silk scarf? What animal makes it? Good to have a easy Mission once in a while..... LOVED IT!!!!!! Me too Emma.... SUPER easy!!!!!!!!!!!! I agree sunshine3-21-82...... :) atleast some kind or reward like 5 RC If u can get it done in like 2 days or a day. I got this one done in 8 hrs and I didnt skip one thing on here. I even found the needle on first try. They should have special points for getting the mission done fast. and No RC used unless its parts for a machine trees or habitat. 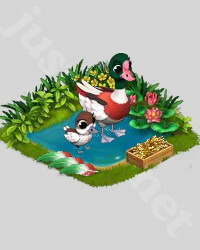 I cant place the reward in the pond water!! peeps I find the needle on the top of the left haystack as you face the screen.I know is randomly but...who knows?? Is there any way to get a free Silk Bush?? What materials we need to ask for granny knitter? The reward is the Shelduck Habitat, and it gives you a Shelduck feather. Mess: Granny Knitter cost 9 RC. I already have the answer... I just opened my game and this one is there ;) good luck and happy farming peeps! I wonder which one will come next? how much RC for the Granny Knitter? Page generation time 0.0262 sek.